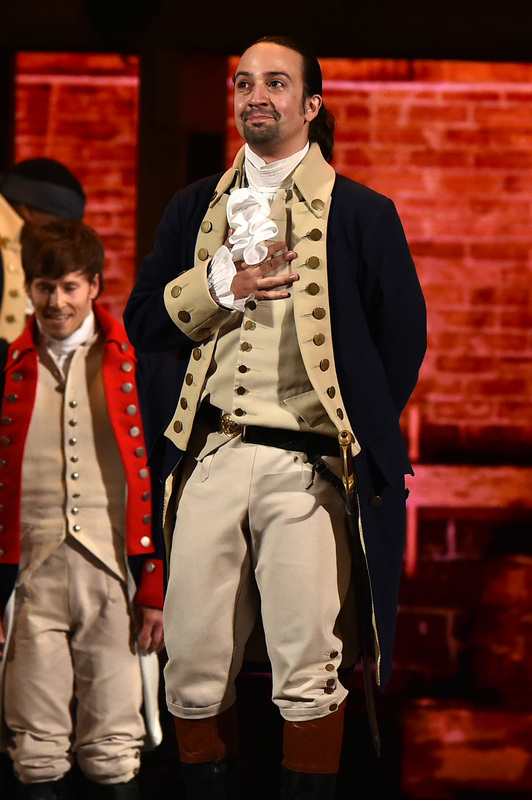 Throw a hand on your heart, guys, and prepare to swell with patriotic pride, because on Friday, a Hamilton performance with vice president-elect Mike Pence in attendance delivered some much-needed hope to America. As described by The Hollywood Reporter, the Hamilton audience gave extra applause to lines of notable significance to Pence, including apparently giving a standing ovation to the lyric, "Immigrants, we get the job done." But it was the Hamilton post-show address delivered to Pence which truly managed to express the various feelings and concerns which many Americans are struggling with, following the results of this year's extremely divisive election. The major takeaway here is how to voice your opinion without booing or belittling the other side. "There's nothing to boo here, we're all sharing a story of love. We welcome you, and we truly thank you for joining us here at Hamilton: An American Musical — we really do. We are the diverse America who are alarmed and anxious that your new administration will not protect us, our planet, our children, our parents, or defend us and uphold our inalienable rights, sir. But we truly hope this show has inspired you to uphold our American values, and work on behalf of all of us. We truly thank you for sharing this show, this wonderful American story told by a diverse group of men and women of different colors, creeds, and orientations." There's a lot to respect with this speech and I'm genuinely in awe of it. Not only is it exceptionally heartening to witness the Hamilton cast and crew use their platform to address the current political climate, but the speech also provides a perfectly balanced and profoundly dignified message. And its calm delivery, respectful approach, and positive plea for fairness and civility are something that I think we can all learn from. Because, in the past few weeks especially, I'm sure I'm not the only one who's found herself trapped in an unavoidable debate with someone who shares a wildly differing set of political beliefs. And frankly, those debates can be exhausting. Whether this is happening with family members, friends, co-workers, strangers, or the faceless mass of eager, internet conversationalists (to put it politely), political discussions are feeling more and more impossible to navigate in a civil manner. Which is why this post-show address feels all the more timely and essential to me. The message is absolutely spot-on, necessary, and powerful, sure, but I think that many of us can also learn from the manner with which it was delivered. For starters, I adore the fact that Dixon outright reminded the audience that there was "nothing to boo," because he was absolutely correct in doing so. Booing is cathartic, but it's little more than a simplified and primal impulse. Not only is it superficially negative, but it's also completely nonconstructive. Nobody ever won a damn debate by simply booing down a microphone at someone. Not even Donald Trump. Booing the big bad of your political beliefs won't explain to them why you object to their opinions, methods, plans, or approaches — and worse, it'll do little to remind those people of why you inherently deserve to be heard. And this is perhaps what makes Dixon's address so powerful. He knows this, and as such, he carries himself and his words with total grace, in order to ensure that his speech is listened to with all the weight and significance that is deserves to be. And that's truly a difficult thing to do well. Those of us who feel genuinely scared right now at the potential ramifications of the upcoming Trump-Pence administration are ultimately angry, sad, and frankly, overwhelmed. It can be difficult to express our fears, our beliefs and our right to be treated fairly, particularly to people who might already outright disagree with us, without resorting to fury or indignation in response to them. And though it can be difficult to remain calm, to understand the other person's point of view (even if you don't agree with it), and be rational and balanced in response to it, it's essential to do so. Because otherwise, it's little more than a shouting match — a verbal mud-slinging. And, as Dixon's speech was a reminder of, not only can we do better than that but also deserve better than it too. Regardless of our race, creed, or orientation, all of our words, like our rights, are just as worthy of being acknowledged and respected as everyone else's. And with that in mind, I hope that all of us can find that inner calm and composure necessary to speak up and be heard as clearly and as powerfully as we deserve.